There’s a moment in the Super Metroid finale, somewhere in between being brain-blasted by a creature that looks like it escaped from Attack on Titan and being saved by a flying alien parasite, that the whole nature of the battle is suddenly revealed to be entirely scripted. The idea of scripted battles, an idea that was still incredibly new back in the 16-bit era of the SNES, made for something of a rarity in the mid-’90s. Strangely, director Yoshio Sakamoto not only chose to include a scripted battle sequence in Super Metroid, the third entry in one of Nintendo’s biggest franchises, he actually made it the focal point of the entire finale. Stranger still, it worked. Fast forward 20 years and SM‘s final battle remains the most memorable and iconic moment in the history of the Metroid series, and it isn’t hard to see why. Beginning as a direct callback to the original Metroid title for the NES, the battle is outset by a 16-bit re-imagining of that game’s finale. Series protagonist Samus Aran treks deep beneath the surface of the alien planet Zebes to put an end to the nefarious Mother Brain once and for all. Never one for falsely cryptic names, Mother Brain is literally a giant brain in a jar and is mainly protected by machines, with no real attack capability of her own. 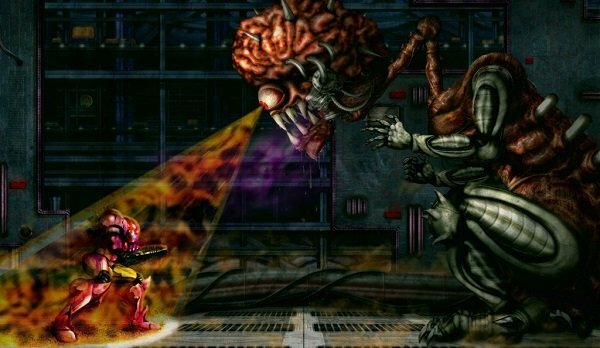 The first bit of the battle goes by in a blink, with the player simply blasting away at Mother Brain using missiles and super missiles, but after the life support machine for this massive wad of grey matter is decimated, the battle takes a pretty dramatic left turn. Out of nowhere the shattered and broken brain rears up onto a giant cybernetic body, Mother Brain rattles out a terrifying screech, the music takes on a note of inevitable cataclysm, and the real fight begins. Except…not really. As mentioned above, this entire battle is almost entirely scripted, and, as such, it’s nearly impossible to come out on the losing end of it. But a first-time player has no idea that this is the case, and it isn’t until you replay the battle a few times that you begin to see the strings. Mother Brain shows off 4 attacks in her new H.R. Giger worthy form: a glowing ring projectile, a timed bomb attack, a fiery energy burst, and, of course, the devastating brain blast. This last bit hits like the Hulk on steroids, draining off an alarming 3-4 energy tanks of a possible 14. The first time it comes out, most players will be picking their jaw up off the floor while they regain their composure, totally unaware that this is all part of an automatic sequence of events. As this tumultuous attack drains the player’s life force in less than a minute flat, Samus soon becomes an inert object, literally brought to her knees as she is forced to wait for the inevitable end. Making this last moment even more effective is the fact that the player retains partial control of Samus, allowing them to make her stand, but never allowing them to move her as this horrifying brain on stilts powers up to crush her for good. Then, just as the grim reaper is wrapping his skeletal claws around Samus’ ankle, her death sentence is suddenly relieved by the most dangerous creature in the galaxy, a metroid. To rewind, in the previous installment, Metroid II: Return of Samus, our heroine was tasked with destroying the remainder of this dangerous species on its homeworld, SR-388. However, in the end, Samus spares a single baby, who then takes to her as if she were its mother. It is precisely this creature, now mega-sized who comes to her aid, draining Mother Brain of her life force in a dramatic display of power. But alas, Mother Brain cannot be felled so easily, and as the metroid shields you with its own body, restoring your health and mobility, she reengages her assault. As the metroid takes hit after hit, it only thinks to attack again once it is certain you are safe but by then it’s already too late–Mother Brain crushes it with a final glowing ring, and the metroid falls to the ground with a cry of distress. It’s a heart-rending moment, something akin to watching your dog get shot after it has just saved your life. For many gamers, it was not the timeless tale of Old Yeller that signaled the death of childhood and taught them about the cruelties of the world, but the demise of a nameless space parasite. Only with this emotional gravitas initiated is the last leg of this battle finally ready to begin. The music changes again, becoming a triumphant and rippling theme of justice. Invincible with rage and grief, Samus is a force to be reckoned with and can put Mother Brain down for the count in a matter of a few dozen seconds. A new hyper-beam attack, available only for this brief period, clinches this last encounter even as it begins, and before the player can even wipe away their tears, Mother Brain is no more. This battle with Mother Brain is a master class in wordless story-telling, and it never removes you from the experience. At no point during this encounter does the player realize that they are simply being pushed along a conveyor belt toward the credits sequence, a massive testament to how seamless and enmeshed the finale is in the gameplay and engine that powers Super Metroid from start to finish. It was the death of a thousand childhoods, and a finale that will no doubt live on in perpetuity for as long as the medium itself is in existence. Mike Worby is a human who spends way too much of his free time playing, writing and podcasting about pop culture. Through some miracle he's still able to function in society as if he were a regular person, and if there's hope for him, there's hope for everyone. do we have credit for those original metroid pictures? Found ’em a while back on a few sites, though I’m not sure who owns the originals.